Just continuing to update the blog with articles / blog posts I’ve been writing in other places in the last few months. This is another parenting piece, but a serious one this time! General point: Any pressure on a new mum is WRONG – and this post is in no way a judgement on mums who bottle feed, rather it is an account of my own experience of not being adequately supported in breastfeeding and being repeatedly pushed to switch to formula instead of given the help I needed. Mums who choose to formula feed routinely talk about how much peer pressure they experience with people around them constantly judging them for not breastfeeding. But guess what, the opposite experience can also happen. I chose to breastfed but had tremendous difficulty establishing breastfeeding with my first child. Instead of receiving useful support and guidance when I needed it most, I felt attacked on all sides by medical professionals and family members / friends who were all pressurising me to give up breastfeeding and opt for formula instead. So here’s a blog post I wrote on this subject a couple of months ago for The Motherload, a parenting blogzine I’ve already mentioned I sometimes write for. I was amazed at how many comments this post generated on The Motherload Facebook group, (a popular mum group with 75,000 members) with many other mums sharing similar experiences of feeling pressurised by friends / family members / midwives and other medical professionals to give up breastfeeding at the first hint of any problem and switch to formula instead. (CLICK HERE TO READ THE POST DIRECTLY ON THE MOTHERLOAD, OR KEEP READING FOR THE FULL TEXT). She reports how from the minute babies are born in this country, and from the very first sniff of any problem with establishing breastfeeding, many mums describe an immense pressure from medical staff, friends and family to give their baby formula. Instead of new mums being supported to learn how to breastfeed successfully, it seems that many of us are far too quickly pushed into either ‘topping up’ with formula, or else abandoning breastfeeding altogether and switching over to bottle feeding. Before talking more about my own experience, I want to emphasise that this post is in no way a criticism of women who choose to bottle feed. My concern is about this entirely unhelpful pressure to switch over to formula that mums who wish to breastfeed repeatedly experience. 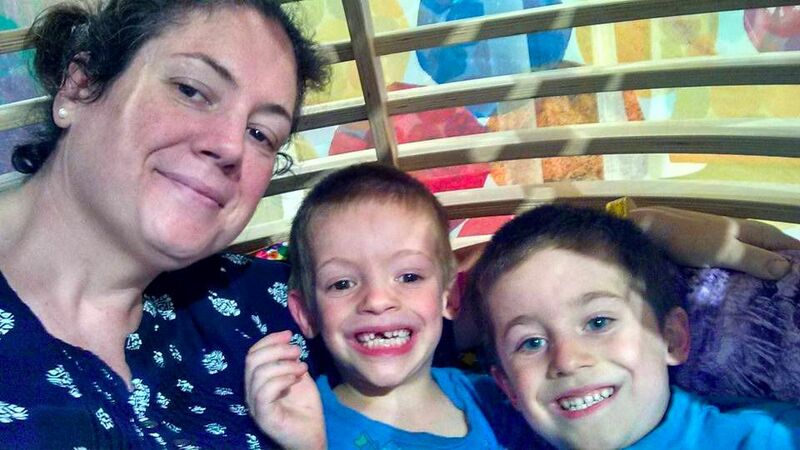 After my son was born in New York five years ago, I experienced a severe postpartum haemorrhage. This meant that instead of the magical first 24 hours I imagined I’d experience with my long-awaited new baby, I was rushed off to emergency surgery straight after delivery, and then spent the first night in the recovery room, receiving blood transfusions and under constant monitoring. I did not see my baby again until the next afternoon. This also meant that I missed out on the crucial first 24 hours for establishing breastfeeding. And that contrary to my plans, my son was formula fed for the first 24 hours of his life. I took it upon myself thereafter to try and make up for lost time and did everything I could to get the breastfeeding going. It was a pretty relentless battle but it was really important to me so I didn’t give up. But with my body weak from the traumatic birth and blood loss, I found that I could not establish a strong milk supply quickly, even with long hours spent cluster feeding. Given this reality, and knowing that my son was already used to formula due to my absence after his birth, I realised quite quickly that I would have to – at least initially – combine breast / formula feeding. What I did not expect, however, was the screaming chorus of people all around me trying to persuade me to stop breastfeeding altogether and just give him formula. For a start, the temptingly easy ready-made formula bottles with their perfectly adaptable teats were constantly offered to me and baby for the couple of days I stayed in the hospital after the difficult birth. Formula was taken as a given by the medical staff at the New York hospital I was in – their question was only how often and how much did I want to give him, not if I wanted to give him formula at all. No one told me that the more formula I give, the harder it would be to increase my milk supply. They just wanted the baby fed quickly and efficiently. What did I need to struggle for when there was this easy alternative staring me in the face? This was the overriding voice I recall from those first few hazy sleep-deprived months. It would have just been so easy to give in to the pressure. Formula was everywhere, screaming out “DRINK ME”. Especially as for all the time I was struggling, I knew that my baby preferred the formula as he got his fix more quickly. I was constantly questioning my choices and wondering if I had got it all wrong, feeling guilty and anxious. Was I needlessly making my baby suffer? In the end, it turns out I’m a pretty stubborn mule, and I kept going. With the help of an electric pump, I started expressing five times a day to increase my supply; I learnt everything there was to know about natural supplements to boost milk supply. And thanks to a La Leche League friend, I finally overcame issues with my baby’s latch. And with all this superhuman effort, after about four or five months of combined feeding, I achieved what seemed like the impossible – an exclusively breastfed baby. It was a wonderful sense of satisfaction. Since that first-time struggle, I have given birth twice more (in the UK), and have had a positive experience exclusively breastfeeding for over a year both times. If there is one thing I can conclude based on watching “Breastfeeding Uncovered” and my own story, it is that the whole narrative of health professionals (and our own peers) needs to change in relation to breastfeeding mums – especially if the UK is to tackle its low breastfeeding rates. Let the narrative be about helping new mums who wish to breastfeed make a success of it – and feel confident in their choice – not undermining them or pressurising them to give up. Single, Orthodox – and a mother? 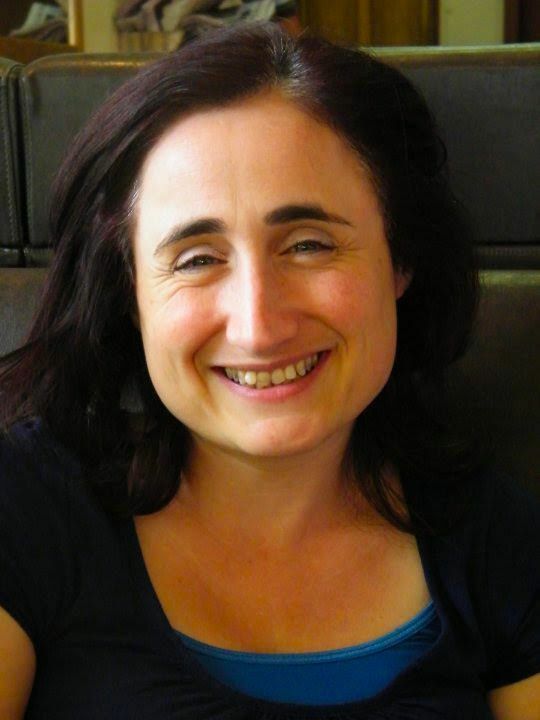 I recently interviewed Dina Pinner, co-founder and co-director of an amazing Jerusalem-based organisation, KayamaMoms, that supports single religious Jewish women to become mothers. 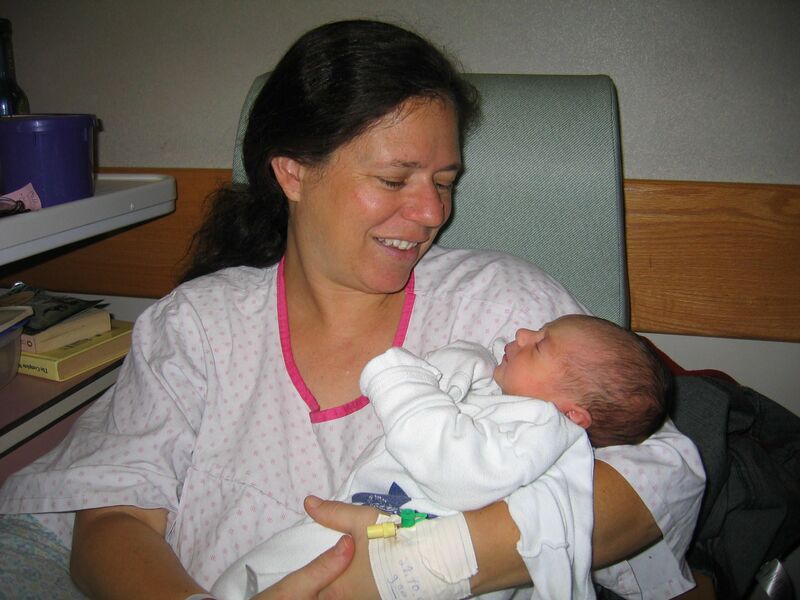 With this impassioned plea, Aviva Harbater opened up the 2011 inaugural conference of KayamaMoms, a Jerusalem-based organization set up to support religious women anywhere on “the single mother by choice journey”. Five years later, KayamaMoms can take credit for some 48 babies born to single mothers, and for creating a unique supportive community for these alternative families. The organization provides information on pregnancy and adoption, advice on financial planning and parenting, and runs seminars and regular support groups. 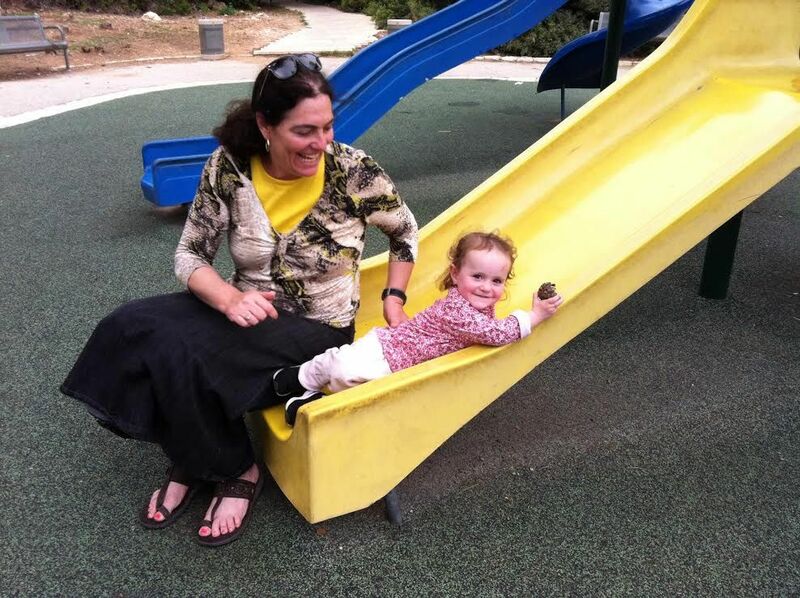 The Sisterhood recently interviewed KayamaMoms co-founder and co-director Dina Pinner, originally from the U.K. and living in Jerusalem for many years now. Rebecca Schischa: How did KayamaMoms come about? Together with my co-founders / co-directors, Yael Ukeles and Dvora Ross (and another woman who since left the group and got married), we spent a year planning, and our inaugural conference took place in November 2011. How does KayamaMoms support single women to become moms? We run two separate monthly meetings. One is for anyone on the journey to becoming a single mother by choice — to talk, ask questions, think out loud. We’re an international organization and have two secret Facebook groups, one in Hebrew and one English. We have women from the U.S., England, Europe, all over the place. I’ll be in New York and London in the next few months and hope to organize meetings in both places. 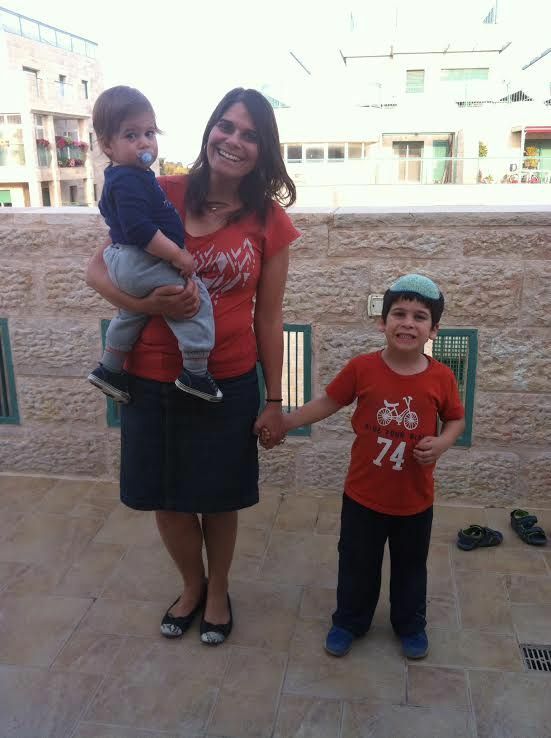 Have attitudes changed towards single mothers by choice in the religious community in Israel? We knew we had become mainstream when my friend — who always tells me about Yossi, the janitor at the big organization where she works, who’s been saying to her for years: “Nu, when are you getting married?” — called me up and said: “You cannot believe what just happened to me! Yossi said to me: ‘What are you waiting for? Go have a baby! Haven’t you heard — religious women are having babies on their own now!’” We knew we had arrived then. What kind of issues do single moms by choice describe? Are there any halakhic issues involved in single women becoming mothers? There are rabbis who have said we are “destroying the Jewish family”. But there is no halakhic prohibition. Our rabbi-advisor, Rabbi Yuval Cherlow, says that a woman shouldn’t really go into this before she’s around 34, as she should make “a gallant effort” to get married first. He says that ideally women should use non-Jewish sperm to prevent any issues later on of yichus [when someone could inadvertently marry a sibling]. But some women prefer to use Jewish sperm. It’s a personal choice. Alternative families are not going away anywhere, and either we can embrace them or we can make them and their children feel rejected. 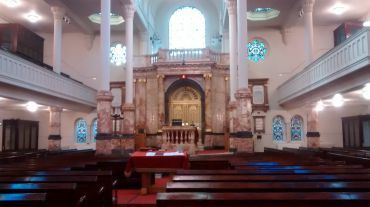 It’s the choice of the rabbi of each community as to what message they want to send out: that the unmarried and the childless should be ignored or that they should be embraced. New year’s resolution for 2016: I’ve been working as a freelance writer, editor and (French-to-English) translator for a few years now, and 2016 is the year I’ve decided for ramping up my business. Being a trained journalist and editor, I’ve recently branched out into the field of copywriting for the corporate sector, and was hired for a great job in 2015, writing marketing copy in the form of case studies / success stories for a multi-national business training company. I have translated lots of shorter-length materials before, including website copy, academic writing, news stories and features, but 2015 was the year I translated a whole cookbook into English: A different perspective on cooking, written by Jérôme Fesquet, a French chef with a penchant for healthy eating. It was a satisfying and intellectually stimulating job. An ongoing project I’ve had in the last couple of years has been working as writing coach and editor for a New York-based client writing a memoir on healing from an eating disorder. Well, late 2015 saw the book finally complete – and both of us happy with the end-result. She is now putting the final touches to the book and pitching it to agents and publishers. Here’s hoping to see the memoir published in 2016. I’ve written a fair amount of arts reviews and features in the last few years, but it was only last year that I got my first ever cover story – for Jewish Renaissance magazine– about “This Place”, French photographer Frédéric Brenner’s huge collaborative project exploring the complexities of Israel and the Palestinian territories. It was a great moment opening the magazine when it arrived in the post and seeing the front cover. Here’s a link to some of my other published work as a freelance journalist. Finally – where do YOU come in? Feel free to contact me any time via email: rebeccaschischa at gmail dot com – or directly on this blog via the comments section. Got chatting to a funny-strange New Yorker on the bus tonight whom I almost offended when I lightheartedly accused him of speaking a corrupted version of the English language. Turns out he’s originally English, from the illustrious locale of Bognor Regis, and moved to America when he was eight years old. He even slipped into an authentic English accent to prove his authenticity. 1) He attended William and Kate’s Royal Wedding, not as a mere flag-waving member of the hoi-poloi-riff-raff in the street, but in Westminster Abbey as one of the esteemed invited guests. 2) His claim to fame? He is actually the ‘real king of England’ as his family, from Bognor Regis (Regis = king in Latin), can trace their lineage back to those natives who booted the Romans out of the land of pastures green somewhere way back in the early centuries of A.D., thus significantly pre-dating the Windsor dynasty currently presiding rather undemocratically over the kingdom. I offered to bow down to him, but he politely demurred. 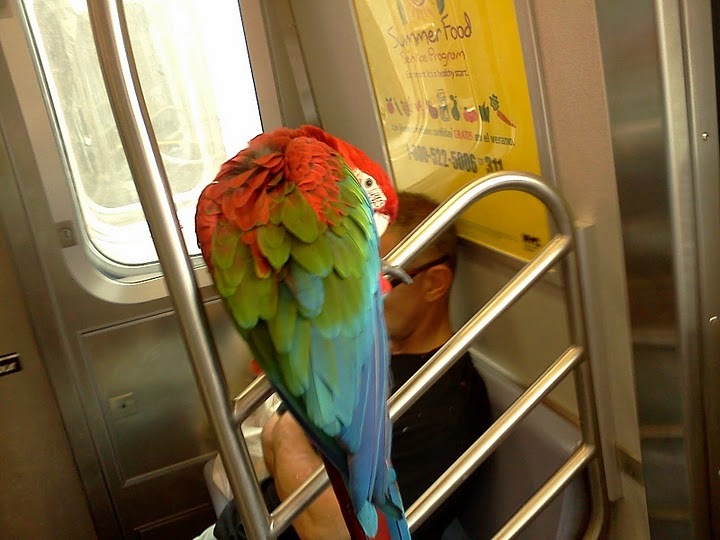 Funny thing was that the man next to the parrot – presumably its owner – was totally indifferent to the surreal aspect of the scene, or to the attention the parrot was creating. 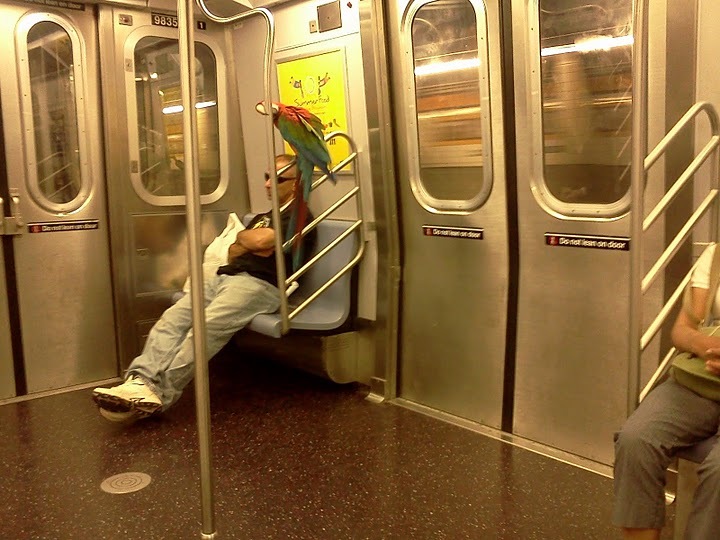 In fact, I think he was simply taking a moment to have a nice little nap.